AMBUSH, based in New Orleans, entered its 35th year of publication with its January 3, 2017, issue. BAY AREA REPORTER, based in San Francisco, entered its 47th year of publication with its January 5, 2017, issue. BETWEEN THE LINES, based in Livonia, Mich., entered its 25 year of publication with its January 5, 2017, issue. BOIMAGAZINE, based in Chicago, has joined forces with BOYSTOWN book series author JAKE BIONDI to publish GATEWAY TO BOYSTOWN, a foldout feature in the center spread of the magazine. The new feature first appeared in the February 2, 2017, issue, with BOYSTOWN model CORY ZWIERZYNSKI on its cover. BOSTON SPIRIT, based in Boston, Mass., entered its 13th year of publication with its January/February 2017 issue. LOU CHIBBARO JR, senior news reporter at THE WASHINGTON BLADE, was honored at the annual COMMUNITY CORNERSTONES ceremony. The awards recognize leaders in the D.C. community who have contributed and positively impacted the lives of local residents. Chibbaro was recognized with the Community Services Pioneer Award in the media category. COMPETE, based in Tempe, Ariz., celebrated its 10th anniversary with its January 2017 issue. DAVID ATLANTA entered its 20th year of publication with its January 4, 2017, issue. GAY CITY NEWS, based in New York City, entered its 16th year of publication with its January 5, 2017, issue. GAY SAN DIEGO entered its 8th year of publication with its January 6, 2017, issue. GLOSS, based in San Francisco, entered its 15th year of publication with its January 6, 2017, issue. GRAB MAGAZINE, based in Chicago, entered its 8th year of publication with its January 10, 2017, issue. JAMES RUSSEL “JR” GUTHRIE, a former editor of PHILADELPHIA GAY NEWS, died on December 20, 2016. He was 68. HOT SPOTS, based in Wilton Manors, Fla., entered its 32nd year of publication with its January 5, 2017, issue. LEFT MAGAZINE, based in San Francisco, entered its 4th year of publication with its January 2017 issue. LIVING OUT, based on Long Island, N.Y., entered its 5th year of publication with its December 2016/January 2017 issue. THE NATIONAL LGBTQ TASK FORCE presented PHILADELPHIA GAY NEWS with its inaugural LGBTQ Media Award for its commitment to elevating voices of the LGBTQ people of Philadelphia and across the country. OUT & ABOUT NASHVILLE, based in Nashville, Tenn., entered its 16th year of publication with its January 2017 issue. PHILADELPHIA GAY NEWS entered its 41st year of publication with its January 6, 2017, issue. Q MAGAZINE, based in Key West, Fla., entered its 12th year of publication with its January 2017 issue. SEATTLE GAY NEWS entered its 45th year of publication with its January 6, 2017, issue. SOUTH FLORIDA GAY NEWS, based in Wilton Manors, Fla., entered its eighth year of publication with its January 4, 2017, issue. 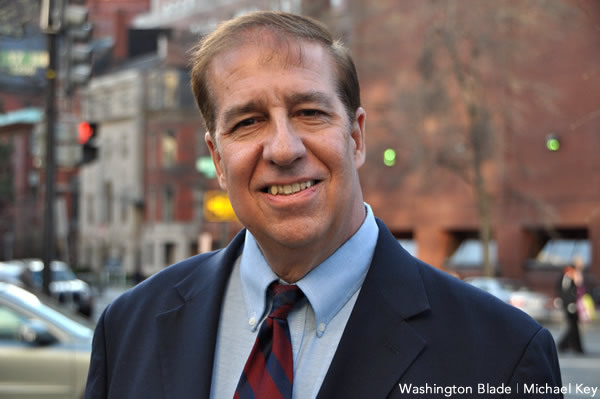 THE WASHINGTON BLADE, based in Washington, D.C., entered its 48th year of publication with its January 6, 2017, issue. WATERMARK, based in Orlando, Fla., entered its 24th year of publication with its January 12, 2017, issue. WIREMAG, based in Miami, Fla., entered its 29th year of publication with its January 5, 2017, issue. The National Gay & Lesbian Chamber of Commerce (NGLCC) has released its first-ever report demonstrating the economic and social influence of America's LGBT business owners and entrepreneurs. 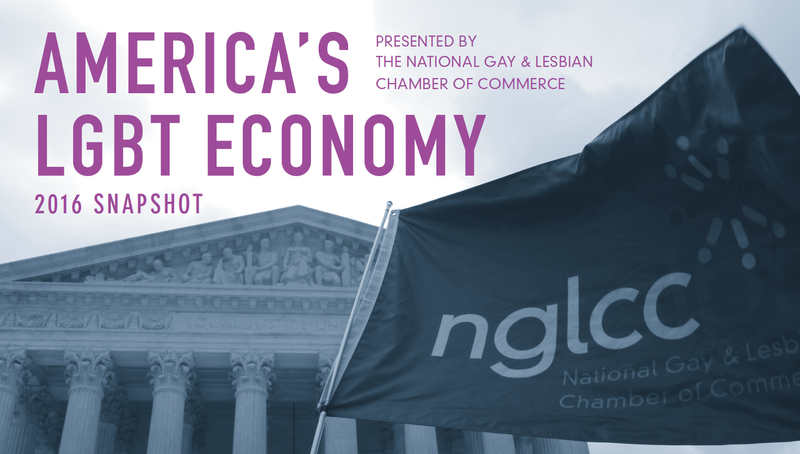 The “America's LGBT Economy” report explores the revenues, types, sizes and geography of LGBT-owned businesses currently certified by NGLCC, as well as the number of jobs they create and the personal stories of successful LGBT business owners. 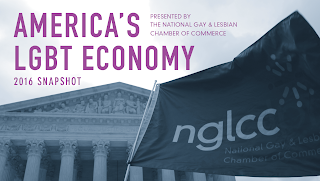 “This report proves what we've observed since NGLCC's founding 15 years ago — that America's LGBT business owners are driving our economy upward and deserve every opportunity to keep creating jobs and innovating our industries,” said Justin Nelson, NGLCC co-founder and president. In early 2004, NGLCC created a best-in-class diversity certification program, making it the exclusive national third-party certifying body for LGBT Business Enterprises (LGBTBEs). The report was prepared by Bob Witeck of Washington, DC-based Witeck Communications, a certified LGBTBE. Nelson believes LGBT media will benefit from the large number of successful LGBT-owned and operated businesses. “As our report shows, LGBT business owners are thriving in every sector and in every part of the country,” Nelson said. “This reinforces the importance of authentically telling our stories in a way that cuts across all diverse communities. There are many LGBT media firms and outlets currently certified by NGLCC, and we know this report will encourage even more to tap the ever-growing network of opportunities in the LGBT business community. “At NGLCC, we have nearly 200 corporate and government partners that understand not only the value of the LGBT dollar, but the economic imperative of inclusivity and LGBT visibility in their supply chains and marketplace,” Nelson said. “This groundbreaking report proves our NGLCC philosophy that economic visibility, just like social visibility, is essential in building a diverse and inclusive society — and advertising in LGBT and allied media are essential to expanding that visibility. 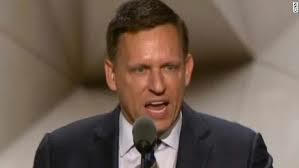 Then came the name — Peter Thiel. But some readers were none too pleased. PPQ: What feature or features of Out In Jersey have been the most popular with readers? Publisher Peter Frycki: Celebrity interviews are by far the most popular and our in-house Madame ZZ “My Stars” column. Frycki: Out In Jersey was the only name that was a good fit when the previous local publication Trenton Out and About went statewide in 2002 under the new ownership. The decision to go statewide was made because there was no statewide publication in New Jersey in 2002. Frycki: Marketing and advertising has always been a headache as the state of New Jersey is sandwiched between both New York City and Philadelphia with their larger metro areas and many LGBT publications over the years that compete from the adjacent states. PPQ: What challenge or challenges is Out In Jersey facing now? Frycki: Although marketing and advertising remains an issue for Out in Jersey magazine and our website, the staff is always looking for ways to remain relevant in the digital climate. As a bimonthly print magazine, we need our digital to carry us through on a daily basis. Eighty percent of our content only appears online. Almost all news stories, some features, all event announcements and most commentary pieces go online only. A large majority of our local theatre, book, music and movie reviews also appear online only. PPQ: How has Out In Jersey changed since it was first launched? Frycki: We are striving to grow and have more voices from all parts of the LGBT community. PPQ: What has been the biggest news story or stories Out In Jersey has covered? Frycki: The time when then-Gov. Jim McGreevey came out as a gay man while in office, and then resigned, is still the biggest story we’ve covered. Frycki: More than once I have been told by someone that they only “read” Out In Jersey for the photos. They were disappointed we did not have more photos. I have since realized that the digital age has made the photos even more important to some readers than the text content. Frycki: It may consume every spare moment. Plan ahead and be ready for that.